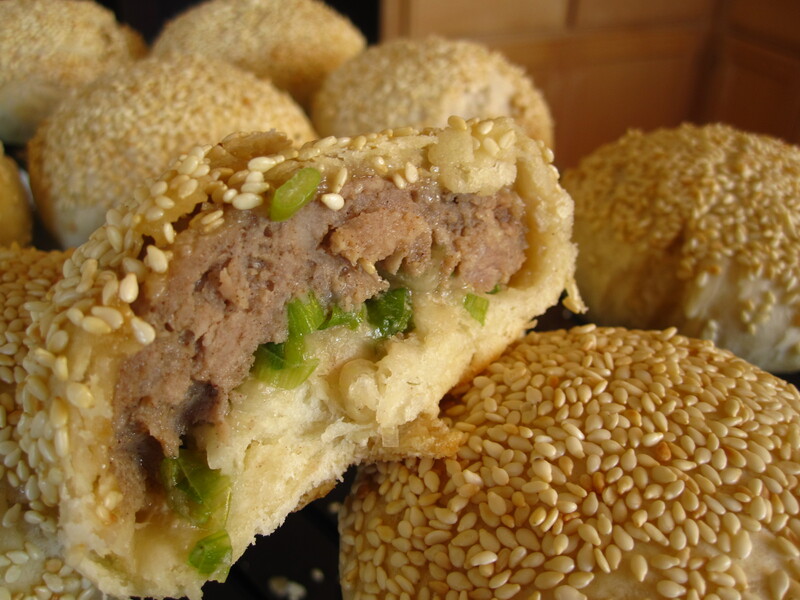 Wife pastry ‘lou por paeng’ is sweet while Husband pastry ‘lou kong paeng’ is savory. They are both Cantonese pastries. This is my first attempt making ‘lou por paeng’. I’m not into sweet stuff so I find it a little too sweet. However, I gave some to two of my neighbors and they both said the pastry is not too sweet. 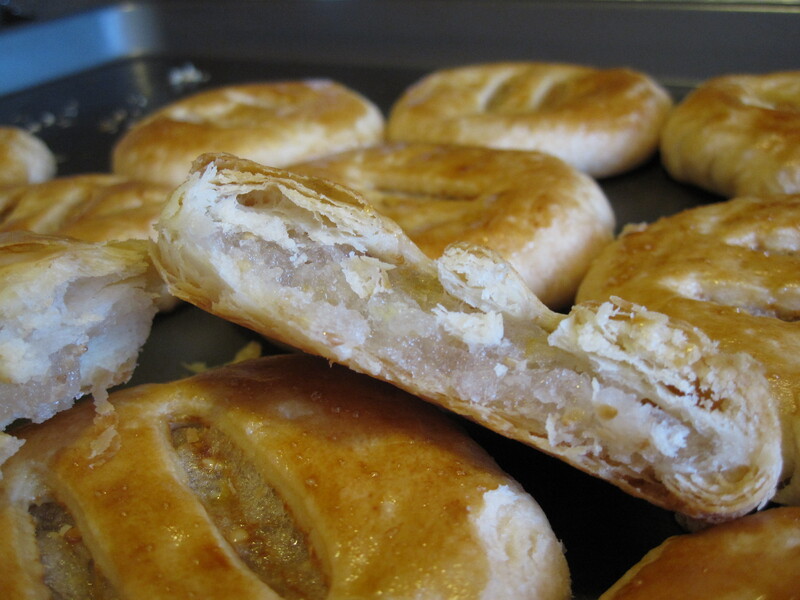 Please note this version of ‘lou por paeng’ uses more candied winter melon and thus producing a more chewing texture, which is different from some bakeries’ version that is more of a paste texture. Probably because I was only making a small amount, I didn’t think the procedure is that time consuming. I had ‘lou kong paeng’ recently and I like it much better than ‘lou por paeng’. I should try the savory ‘lou kong paeng’ next time. Prepare water dough: Combine all flours and sugar in a bowl, rub in shortening to a crumbly stage. Slowing add just enough water to form a soft and non-sticky dough. Knead until smooth. Shape into a ball and wrap with plastic wrap. Rest for 30 minutes. Divide into 14 portions. Prepare oil dough: Rub shortening into flour and knead to form a soft dough. Rest for 30 minutes then divide into 14 portions. While both doughs are resting, prepare the filling: Finely chop together candied winter melon, sesame seeds and grated coconut. Transfer to a bowl and add sugar, glutinous rice flour, salt and oil. Stir to combine. Slowly add just enough water to form a ball. Divide into 14 portions. Take 1 piece of oil dough to wrap inside 1 piece of water dough and seal well. Be sure to wrap tightly and eliminate any air pocket. Flatten the dough with your palm then roll it out into a long oval thin dough using a rolling pin. Roll the dough up like a Swiss roll. Turn the dough 90°, flatten it and roll it out thin. Then roll it up like a Swiss roll. Repeat step 4-5 with the remaining water dough and oil dough. Take 1 piece of pastry dough, pinch the long ends together then flatten it so the dough is roughly round shape. Roll the dough out to a circle. Wrap in 1 piece of filling and seal tightly (be sure no air pocket inside). Flatten the wrapped pastry with your palm the roll it out slightly to 1/3 inch thick. Repeat with the remaining pastry doughs and filling. Cut 2 parallel slits on the top (seal side down), brush with egg wash. Place pastries on a baking sheet and bake in preheated 400°F oven for 16-18 minutes. This is not really a new recipe. 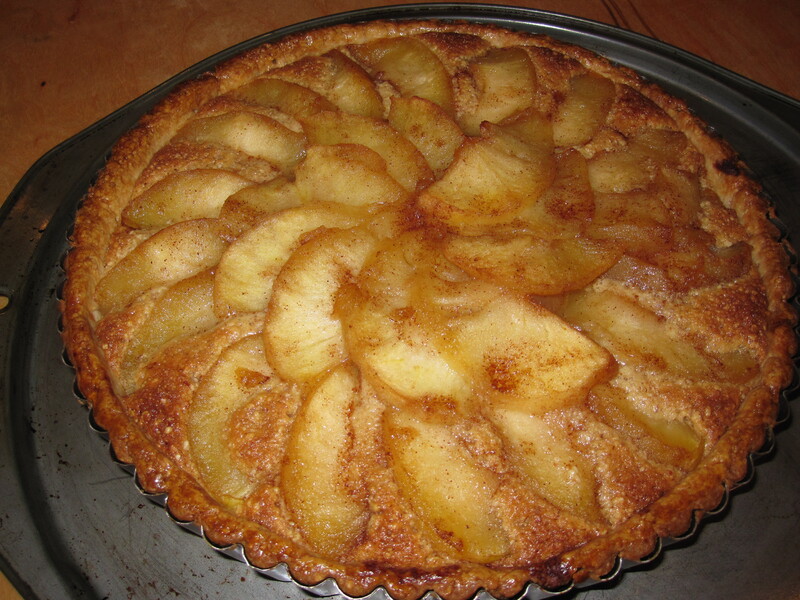 The filling recipe is from Tart Tatin; the tart shell and almond cream recipe is from Tarte aux Noix. 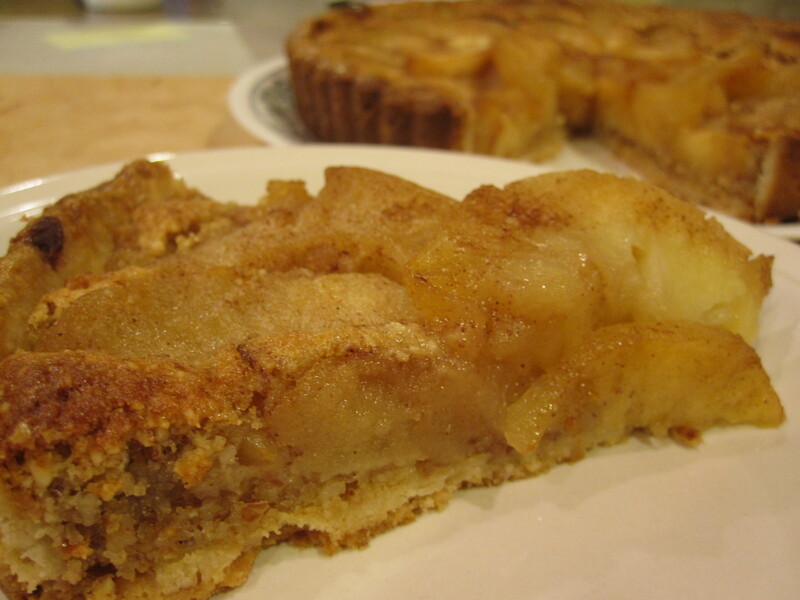 The result is very rewarding: The almond crust is flaky, the almond cream is rich with hint of rum, but not too sweet. The tartness of the apples offset the richness of the cream. We couldn’t wait, decided to dig in 5 minutes after it was out of the oven, and the four of us finished more than 3/4 tart in one serving. This recipe is a keeper! Peel apples, Cut in halves and remove stems. Remove core using a melon ball scooper. Put apples in a big bowl and sprinkle generously lemon juice, toss to coat apples with juice. Melt butter in a frying pan. Add sugar and cinnamon, stir to combine. Continue to cook the sauce on med. high heat until it turns to med. caramel color. Remove from heat. Arrange apples halves(discard lemon juice), standing up around the pan and in the middle, tuck in apples tightly as they will shrink during cooking. Return to med. heat and cook until the bottom half is colored. Using a spoon gently turn apples up side down to cook the other half. About 20-25 minutes total cooking time. Scoop out apples. If there’s still lots of liquid in the frying pan, continue to cook down the sauce until it thickens. Pour the thickened sauce over apples. When the apples cools down completely, slice into 1/2 inch thick wedges. Combine cake flour and ground almond then set aside. Using a whisk, cream butter and sugar until fluffy. Slowly add beaten egg, whisk to combine. Sift in 1/3 of flour mixture. Using a spatula gently mix the flour on the top, then press down the flour to the bottom of the bowl to combine. Repeat with the remaining flour in 2 batches. When all mixture starts to form a dough, take it out and shape it to a ball with both hands (avoid kneading the dough!). Put the round dough between 2 pieces of plastic wrap, roll it out large enough to fit tart pan. Remove plastic wrap and transfer the dough to tart pan and fold inwards any extra dough so all sides have same thickness. Chill in freezer for 20 minutes. Brush the edge with egg wash, prick the bottom and side of tart and blind bake at preheated 350°F oven for 10-12 minutes until edge is slightly brown. Cool the tart in the tart pan. Cream butter and brown sugar with a whisk until fluffy. Slowly add beaten egg and whisk to combine. Add ground almond. Using a spatula, mix until all incorporated. Sift in cake flour and mix gently until just combined. Add rum then mix gently to combine. Pour filling into baked cool tart shell. Smooth the surface and arrange apple slices on the top. Bake in preheated 350°F oven for 35-40 minutes until almond cream is nicely browned. Cool tart in the pan on the rack for 10 minutes before removing tart pan. Serve warm. The recipe is from Rasa Malaysia; I just change the ingredients amount for 4 chicken leg quarters instead. The chicken is indeed very delicious, tastes just like the ones sold in the Chinese BBQ stores. Thanks again Rasa Malaysia for sharing the recipe. Don’t let the kind-of-long ingredient list scare you; it’s pretty simple– just throw everything into a big pot. I do however need to master the skill of cooking/boiling chicken in a broth– mine is always over cooked and/or the meat is too tender. Any tips of cooking/boiling chicken so the skin is QQ and meat is not overcooked, please let me know. Add all ingredients (except the chicken) into a deep pot and bring it to boil on high heat for 15 minutes. Add the chicken quarters into the pot and boil over high heat for about 10 minutes. Lower the heat to simmer for about 30 minutes. Partially cover with lid. Turn off heat and let the chicken steeped in the soy sauce mixture for a few hours to soak in the flavor. When meat cools down, chop into pieces and serve at room temperature with steam rice. Note: The soy sauce broth leftover is also good for making stewed eggs and stewed tofu. Just remove the oil from the the surface so the broth lasts longer in the fridge. I have 4 overripe bananas sitting on the kitchen counter. 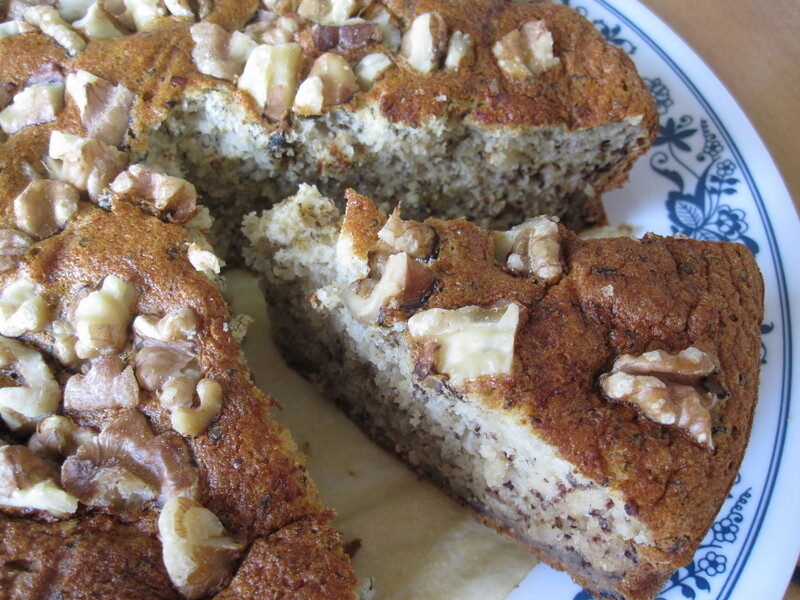 I used 2 for banana waffles and the remaining 2 to try out this banana cake recipe, which uses egg white instead of whole eggs– what a good way to use up my egg whites leftovers from CNY bakes! 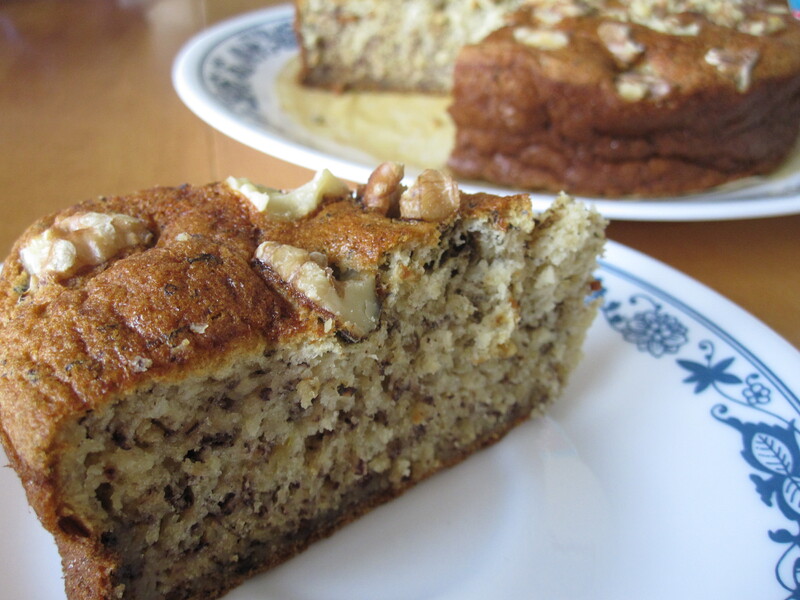 I make some changes to the recipe and use a 8″ round pan instead of loaf pan. The cake turns out nicely browned, about 1.5-2 inches tall, and NOT sweet at all. The banana flavor is very subtle… definitely will have to add more bananas and sugar on the next trial. Preheat oven to 350°F. Grease and lined the bottom of a 8″ round cake pan. Use a mixer, beat bananas and sugar on high speed until pale color. Sift in cake flour and baking soda into the banana mixture. Gently fold in until there’s no dry flours. Add orange juice, rum and vanilla extract. Gently fold in to combine. Whisk egg whites separately until peak. Gently fold in egg whites to the banana batter in 2-3 batches. Pour into cake pan. Sprinkle chopped walnuts on the top. Tap the pan 1-2 times on counter to get rid of big air pockets. Bake in the middle rack for 5-8 minutes. Reduce temperature to 325°F and bake for another 25 minutes until cake is done. Remove from the oven and invert the cake immediately on a rack to cool completely. Look is deceiving– this speaks so well for this wonderful vegetable dish. Everyone, including myself, who first look at this dish will think that there’s nothing special about it, but after the first bite then there’s the treasure. My sifu Aunty Wang brought this dish for our CNY potluck, I love it so much that I decided buy the ingredients and make it that weekend. Richard told me that when he saw the food he thought it is made of all kinds of yucky veggie leftovers, but then he was hooked after the first bite. This dish is best eaten at cold or room temperature as you can really taste the different flavors– and that is why I can eat it 3 days straight and still don’t get tired of it, because each type of vegetable has its unique flavor, and all the flavors go very well together. 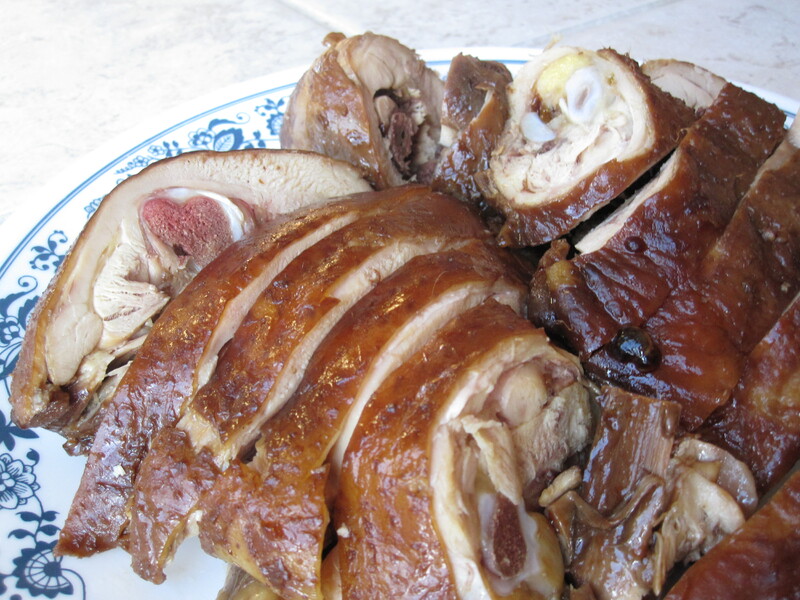 According to Aunty Wang, this is a typical Shanghai CNY dish. Chinese is very particular about new year food. Combo in Mandarin is called ‘Shi Jin’– sounds like ten ‘Shi’, and thus the name is called Ten-Veggie Stir Fry. Of course, you don’t have to include all ten ingredients. You can also substitute one for the other like shredded tofu puffs, preserved sweet turnip etc…, but avoid using vegetable that has high liquid content or draws out liquid over time like bell peppers, black fungus etc… so the food can be kept longer in the fridge without turning slimy or watery. *1 cup dry lily flower ‘jin zhen chai’– soaked till soft, then tie a knot and remove the stem part, rinse 2 times to remove any yellow color. *1 cup preserved salty & sour mustard green stems (hum swiin choy)– cut into thin strips, then rinse two times to remove the saltiness. 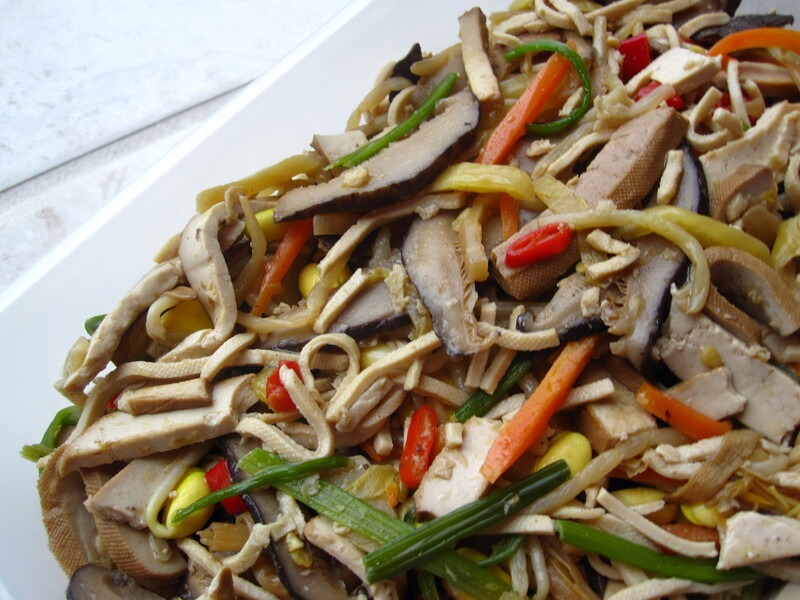 *1 cup frozen bamboo shoots– cut into thin strips. See note below. Heat up wok. Add a little oil and saute the first 8 ingredients, one at a time, until aromatic. Lightly season to taste. For ingredients with *, add a little soy sauce too. For soy bean sprout: saute on very high heat. When the liquid draws out, continue sauteing until the liquid dries out. Dish out all veggies into a big bowl. Heat wok again, saute garlic and peppers until aromatic. 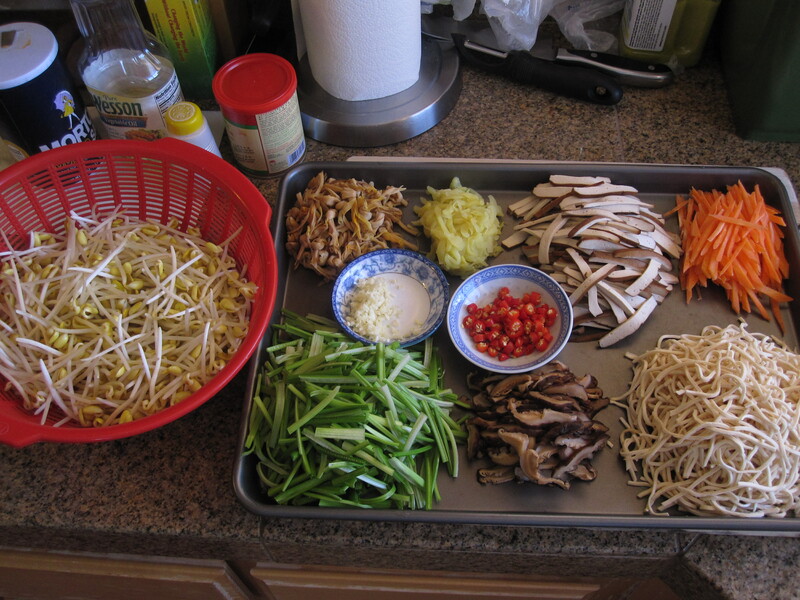 Return all sauteed veggies back to the wok, add celery stems and stir for a few more times to combine. Add sugar and seasoning to taste. Bamboo shoots: frozen is better than canned ones. I seldom use bamboo shoots so I skip this ingredient. Once cooling down completely, this dish can be chilled in the fridge and can be kept for 8-10 days, just use a clean dry spoon to take out the portion you need each time. I saw this recipe posted in Lily’s Wai Sek Hong, where she got it from this Chinese cooking video. The pastries (from Lily and the video) looks so good that I gave it a try. Indeed, it’s very delicious and peppery. I have never had one before so I don’t know what is the original authentic taste, but I like my version except it’s a little sweet, next time I will cut down the sugar. If you understand Mandarin and some Hockien, check out the video as the cook shares some tips. Also, the cook uses more white pepper and soy sauce paste than the recipe calls for. When making the yeasted dough, the cook mixes yeast with the flour before adding water– I followed this approach but found out that the yeast does not completely dissolve into the dough. I should have dissolve the yeast in the water instead of adding it to the flour. Combine two ground meat. Add in soy sauce paste, white pepper, sugar, salt, five-spice powder, sesame oil and water. Use chopsticks to stir in circular motion until all seasoning combined and the meat is “sticky”. Chill for 2-3 hours or overnight. Then divide into 10 portions. Prepare yeasted dough: Combine flour and salt. Dissolve yeast in 1/2 cup water then gradually pour into flour mixture. Add in remaining water if dough is too dry, a little at a time. When the dough forms a ball, drizzle in oil and hand knead until smooth and elastic, about 8-10 minutes. Rest dough in a bowl, cover and let it rise until double in size. Knead a few times to push out air pockets. Divide into 10 portions and let it rest for 5 minutes. Prepare oil dough: Combine shortening with flour and knead to form a dough. Divide into 10 portions. Roll out 1 piece of yeasted dough, wrap in 1 piece of oil dough tightly to seal. Roll out to a long oval shape, then roll up like a swiss roll. Turn 90° and roll out to a long oval shape and then roll up like a swiss roll again. Repeat with the remaining doughs. Rest the roll up dough for 15 minutes. Take 1 piece of dough, press index finger in the middle of the dough, then use thumb and middle finger to pinch the two long ends together so the dough is roughly round shape. Roll out to a thin circle. Wrap in 1 portion of ground pork and top with 2-3 tbsp of green onion. Pinch the edge of dough to seal tightly with seal side facing down. Repeat with the remaining doughs and filling. Dip the top of the wrapped pastries with brown sugar syrup then dip into roasted sesame seeds to cover the top. Place pastries on a greased baking pan and rest for 20-30 minutes. Bake in preheated 350°F oven for 20-30 minutes. Open the oven door slightly after first 10 minutes so the pastries crisp better (thanks to Lily for this tip!). Cool on a rack. Clean duck thoroughly by rubbing it with some salt. Rinse. 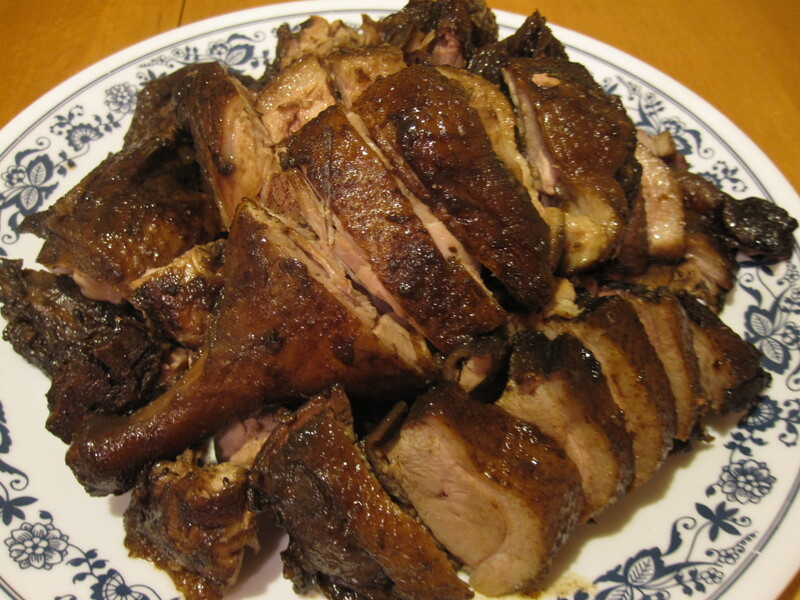 Rub about 30 grammes of 5 spice powder over the duck and allow to marinade for 1 to 2 hours. Pound the galangal, garlic and shallots separately. Heat 2 tablespoons of oil in wok and saute shallots till aromatic. Remove shallots. Add garlic and saute till aromatic. Remove garlic. Add galangal and saute till aromatic. Return shallots and garlic into the wok and stir together with galangal till even. Add dark soya sauce and sugar. Stir well. Add duck and coat it with mixture. Allow duck to cook and shrink slightly. Control heat so that duck does not burn. Once duck has shrunk slightly, add about 200 ml water and allow it to boil. Continue with another 200 ml and repeat process till 1 litre of water used. The water should be filled up to at least half the duck. Add remaining 5 spice powder and reduce heat to simmer. Stew/simmer for 1.5 hours turning every 10 minutes. Add salt to taste and water if it is drying out. Remove duck and drain off excess gravy. Allow to cool before serving with gravy (sieve gravy to remove spices before serving). If after 1.5 hours of stewing and the liquid is still watery, remove the duck and just cook down the liquid until it thicken a little (if you have chicken hearts or gizzards on hand, you can add in this time to stew). When the sauce thicken, return the duck back to wok to stew for a little while, then the duck and the sauce will be flavorful. Don’t throw away any sauce leftovers– it’s good for stewing eggs and tofu!